Fig. 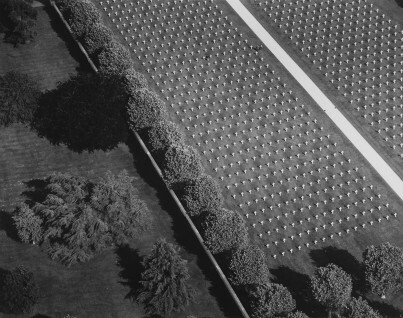 1 Vue d’oiseau, Cimetière militaire (Bird's eye view, Military cemetery), by Marilyn Bridges. 1992. 37.8 by 48.2 cm. (Commande Mission Photographique Transmanche n°21, 1996, Coll. du CRP/; exh. University of Brighton Galleries, Grand Parade). Fig. 2 Installation view of Ronde de Nuit (Night Watch), by Lewis Baltz. 1990–92. (Commande Mission Photographique Transmanche n°9, 1996, Coll. du CRP/; exh. University of Brighton Galleries, Grand Parade; photograph Nigel Green). Fig. 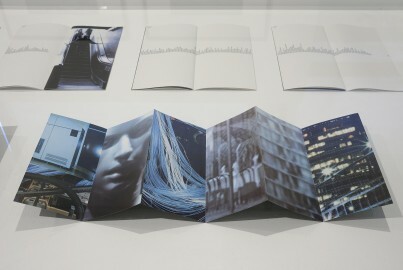 3 Installation view of Homesick, by Hrair Sarkissian. 2014. Two channel video, 11 min. and 7 min. (Courtesy the artist; exh. 23 Dukes Lane, Brighton; photograph Nigel Green). Fig. 4 Installation view of Griz Nez Lighthouse, Pas-de-Calais, France. Seen from Cliffs of Dover, England, from the series Lighthouse 2017–18, by Donovan Wylie. 2018. Front-lit Giclée print, 200 by 150 mm. ; Lightbox 205 by 40 by 220 cm. (Courtesy the artist; exh. 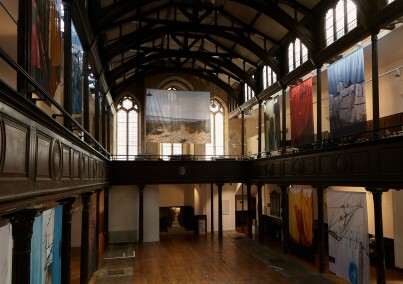 Fishing Quarter Gallery, Brighton). Fig. 5 Empathise (B), from the series Habitus: Potential Realities, by Heather Agyepong, 2018. Matt poster paper, 59.4 by 841 cm. (Courtesy the artist; exh. Jubilee Library, Brighton). Fig. 6 Installation view of Homes, by Harley Weir. 2016. (exh. Fabrica, Brighton; photograph Nigel Green). What does Europe look like today? And how might Britain’s position within it – often at a cautious, reserved or proud remove – play out against its many connections and interrelations with the European mainland? The Brighton Photo Biennial 2018, the first curated by the new director of Photoworks, Shoair Mavlian, asks what this ‘new Europe’ might become after the United Kingdom’s proposed withdrawal from the European political project. It takes the refreshing stance that such a story should not be told from only one position: it is described not only from the perspective of British identity, but also through narratives of collaboration and disconnection, embedding globalised subjectivities and incorporating experiences of migration. Comprised of a single large exhibition and a grouping of smaller projects, the Biennial benefits from its human scale, demonstrating a commitment to the quality, rather than the quantity, of encounter. A striking and surprising impact is made by the exhibition of work by the Cross Channel Photographic Mission, or ‘Mission Photographique Transmanche’, which returns the viewer to a period of pre-Brexit collaboration. From 1987 to 1994, initiated in response to the construction of the Channel Tunnel, the Mission was a French-British collaboration that commissioned international photographers to explore the social and industrial transformations brought about by the tunnel. It would later be developed by the British partners into Photoworks, the commissioning agency that oversees the Brighton Biennial, making this edition’s analysis both far-reaching and reflective of its own history. The Cross Channel projects – especially those by Marilyn Bridges and Lewis Baltz – reveal the deep topographical connections between the two shores. Bridges’s black-and-white aerial views of the Nord Pas de Calais coast reveal its scarred and marked landscapes, including traces of war FIG. 1, which bind the coasts not just in conflict, but in collaboration and a long-standing period of peace. Baltz’s celebrated Ronde de Nuit (Night Watch) (1990–92) digs into the emerging technological industries and data centres that populate the northern coast of France, and the ever-expanding passages of information and infrastructure that cross the channel. Here Baltz’s work is displayed through colour accordion leporellos that made up the ninth of a series of mail art produced by the Mission FIG. 2. Baltz’s photographs, alongside a checklist of words related to the world of surveillance, serve as a chilling vision of a data-driven future that is now much closer to home. Tellingly, the willingness of the French branch of the Mission to initiate, collaborate, share and store the products of its work is tangible. Work from the British side was never comprehensively collected or archived. By contrast, the French project is fully searchable and available for display: a split wall, slicing along a vertical axis, introduces the exhibition and its origins in the Channel Tunnel project, but it subtly dramatises the distance between British and French commitments to a shared future. Despite the scale of its subject, the Biennial is concise, and it is notable that a number of exhibitions present single works. Highlights include Bill Brandt’s first photobook, which is displayed in a glass case and in the form of spreads on the surrounding walls. In its call to the singular attention of the reader, the photobook form recalls the codex as a conveyor of substantial visual evidence and reflection. The English at Home (1936), which combines images depicting high society and the working class, is arguably more powerful in the present format than if it had been published as a series of individual prints. The wall text’s subtle reminder of Brandt’s German heritage might go unnoticed at first but is poignant – this great British photographer was himself a first-generation migrant. 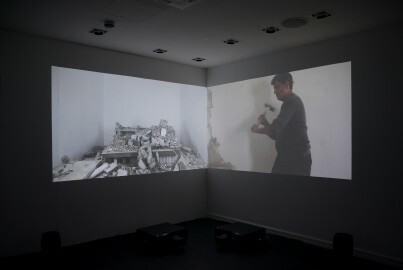 Also on display is a video by the London-based artist Hrair Sarkissian, in which the artist metaphorically demolishes a scale model of his Syrian home FIG. 3 before it can be demolished in actual conflict. Homesick (2014) evidences that that what one leaves behind in migration can still wound deeply. Donovan Wylie’s Lighthouse 2017–18 FIG. 4 is an absorbing image of a darkening coast, mounted on a lightbox. 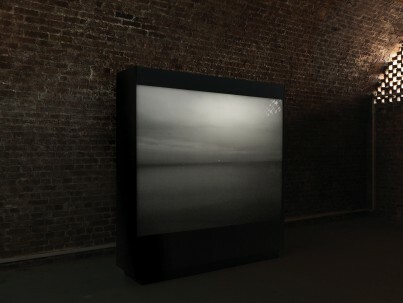 As the viewer becomes accustomed to the darkened space of the gallery, a faint lighthouse becomes visible in the centre of the image. As the eye adjusts it pulses, creating a sense that this still, backlit image shows a light that is flickering, as if about to stutter off. By contrast, larger presentations by Heather Agyepong FIG. 5, Robin Maddock and Harley Weir, are less even. Images from Weir’s powerful photobook Homes (2016), set before and after the demolition of the Calais ‘Jungle’ camp, are translated onto fabrics draped at Fabrica FIG. 6. The saturation of the artist’s colour prints and her attention to detail are lost in this gesture of experimental immersion. Moreover, there are not enough images here to fully enclose the space, and the effect of the installation comes closer to décor than to recreation. Maddock and Agyepong also wrestle with complex and cumbersome display decisions, where less would arguably be more. The Biennial demonstrates that our relationship to Europe is much more complex than the issue of sovereignty initially appears to imply: before governance, there is simple, immovable geography. Beyond geography and political power, there are a multitude of lives, moving in many directions across Europe. 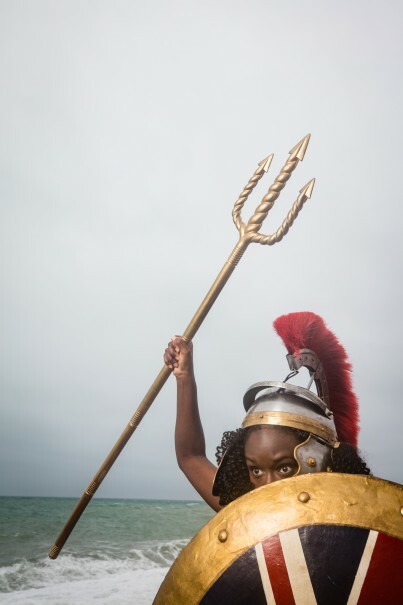 As the Biennial makes clear the notion of distancing ourselves from the continent appears progressively driven by old pride rather than new realities. Duncan Wooldridge is a London-based artist, writer and academic.